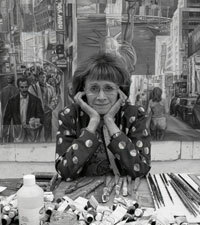 Seltzer derives inspiration from her immediate environment, but uses innovative printmaking techniques to translate these experiences into indelibly personal images. She has been a leader in the art community, contributing to groups such as E.A.T. (Experiments in Art and Technology), and has established a national reputation for her creative application of new technologies in the graphic arts, including research in color Xerography, pochoir ozalid, and heat transfer prints. Since 1986, Seltzer has made tremendous advances in technologies of electrostatic-copier/heat transfer prints. These prints begin with an oil painting made from sketches and photographs. The painting is then placed on a color copier to produce a series of heat transfer prints. After the prints are trimmed and glued together, they are placed in a press to create a final heat-transfer print on paper. This process allows Seltzer to create prints on a scale larger than permitted by conventional graphic media, such as etching or lithography.